When you’re a small game on Steam, reviews can be hard to come by. This isn’t a good solution to that problem. 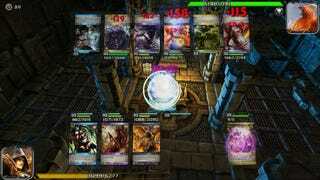 For the past few days, debate has been raging over Epic Cards Battle, a Steam port of a mobile trading card game. The issue? In an attempt to garner more Steam reviews, the game’s developers offered up an incentive: diamonds (an in-game currency that can be obtained with cash) for reviews. This practice is not unheard of in smaller mobile games, but it is frowned upon. Players argued back that this kind of thing—at least, in their eyes—implicitly encourages positive reviews, even if Momostorm didn’t mean for it to. It’s not to Momostorm’s benefit to fork over some of that sweet, sweet virtual rock for a review that crucifies the game. Moreover, it’d be kinda weird for players to write a negative review and then receive currency for the game they hate. What’s the point? There’s also the tricky question of whether or not this kind of thing constitutes a paid endorsement, in which case a disclosure would be necessary for it to be legal. It is by no means a bad thing to collect a broad range of opinions on your game, especially on Steam, where people want quick information about what a game is and whether it’s worth their time. But there’s a line between saying, “Hey, this would really help us” and skewing the whole process—even if your intentions are pure as a baby bunny praising The Lord Jesus Christ by making angels in the driven snow. Probably try to avoid crossing that line.